Will it be enough for the industry to succeed? Poland has lagged behind some of the central and eastern European countries such as Hungary in developing its biotech industry. However, the Polish government has begun to recognize the potential of biotech as source of revenue as Poland’s population of 38 million people, as well as its good links with Germany and Russia, means that there is a large localized market for lower-cost biologics-based healthcare products. To begin to encourage the growth of this industry sector, the Polish government has in the past decade put in place several initiatives to help new biotechs. These include establishing Special Economic Zones, where technology companies receive up to 70% tax exemption for qualifying investment costs; building eight technology parks for biotechs; and setting up NewConnect, the alternative market of the Warsaw Stock Exchange. These factors coupled with Poland’s entry to the European Union (EU) and its access to more funding and expertise has resulted in Poland now having around 70 biotech companies. The main clusters of these are in new science and technology parks at Warsaw, Krakow, Wroclaw, and Gdansk. The majority of these firms are small university start-ups but there are several biotechs worth noting including Polpharma Biologics, Mabion, Biovico, and Blirt. Polpharma Biologics was set up at the Gdansk Science and Technology Park in the Pomeranian Special Economic Zone as a separate biotech division in 2011 by Poland’s most well-established pharmaceutical company, Polpharma. Polpharma, which has been in business since 1935, was privatized 13 years ago, and has divisions in Russia and Kazakhstan with 7,000 employees worldwide. The firm has just completed stage one of constructing Polpharma Biologics in February and now has a fully functioning R&D center in Gdansk, staffed by 25 scientists and growing to 80 staff by year-end, thus being the largest facility of its kind in Poland. At this center, scientists are developing biosimilar antibodies to treat autoimmune diseases, as well as cancers and other disorders. Another interesting biotech also based in Gdansk is Blirt, a more-established biotech start-up in Polish terms, being founded in 2008. The company began life as an R&D company working on development of novel drugs. After gaining experience and the right equipment, the firm began acting as a contract research organization mainly carrying out cell line development, protein and antibody production, as well as the associated analytics and bioanalytics. Now the firm employs 40 people, including 14 Ph.D.-qualified scientists providing services and focusing on its internal oncology and antifungal drug discovery programs. Blirt has identified an innovative and potent oncology drug candidate acting on multidrug resistant (MDR) tumors and anti-fungal compounds, which the firm claims has significantly enhanced potential clinical utility over the parent molecules (Nystatin A1 and Amphotericin B), the golden standard treatments for these diseases. All compounds are at the preclinical stage of development and the company is now seeking licensors with the capability to advance the lead assets through research and development for a range of clinical indications. The aim of the project is to develop an innovative platform for the production of novel biologic therapeutics based on antibody fragments. Blirt is using mammalian cells and single use fermentors (up to 50 L) for antibody production. Manufactured antibodies are then validated by surface plasmon resonance (SPR) technology to confirm interaction with specific antigens. The SPR equipment is used for standard affinity measurements and comparative analysis of biosimilars with the original marketed reference antibody. Blirt intends to introduce the SPR technology as a contract service for biosimilar development. A rising star of the Polish biotech sector is Biovico, based near Gdansk at Gdynia. The company was founded in 2008 and mainly focuses on production of nutraceuticals and medical devices. 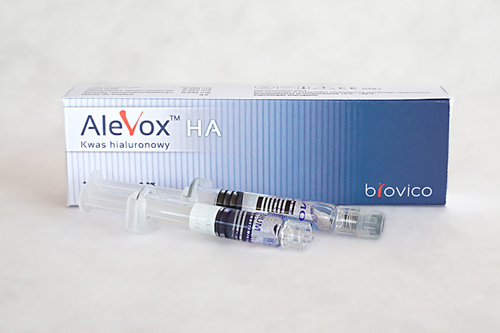 The firm is run by Artur Wilandt, who by his own admission has learned his biotech entrepreneurship and networking skills by spending time training in Cambridge, U.K.
Alevox HA from Biovico is an injectable supplement containing haluronic acid, which is injected into the knee to replace synovial fluid in the joint. Small-scale clinical trials in Poland have shown that burns dressed with Alemat heal in eight days and leg ulcers in 46 days, which Lemke claims is up to 40 percent quicker than those treated with other dressing types and he says patients report less pain during healing. The company is now looking for partners to develop and commercialize this product. Alemat is a bionanocellulose-based wound dressing to treat burns and diabetic ulcers. Without any biological drugs in the clinical stages of development, Poland’s biopharma industry is still in its infancy. However, since Poland has talented yet underexploited scientists, some of the lowest labor costs in Europe and access to EU grant funding it is an attractive prospect for foreign biotech investors. This may help accelerate Polish biotech but a major issue holding back the sector in Poland is a lack of experienced and internationally focused management teams and investors to help commercialize and market the research appropriately. Additionally, according to Polpharma Biologics’ Dr. Zien, it is difficult to attract Polish scientists back to Poland after they have trained in Western Europe or the U.S. and admits that recruitment at Polpharma Biologics of scientists with biologics development expertise gained in foreign labs has been slower than expected. Perhaps the Polish government needs to put in place programs similar to its Homing Program aimed at repatriating academic scientists where those that have trained in pharma and biotechs abroad are enticed back to Poland with incentives as, without this pool of internationally focused expertise to man the pumps, Poland’s ambitions to build a successful biotech industry will falter.